Vendakka Kichadi( Okra/Ladies finger) is a quick side dish for rice. 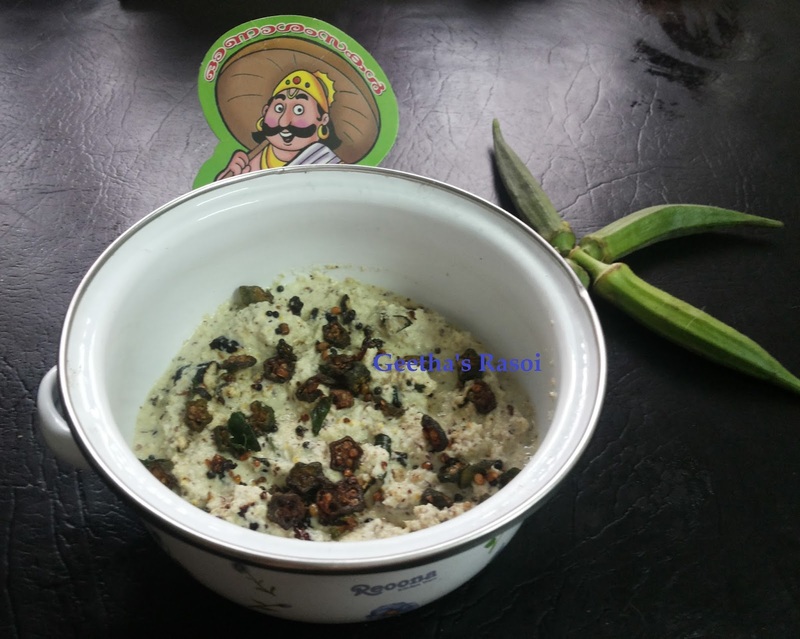 Kichadi is an essential side dish for Onam and Vishu Sadhya. In this recipe okra or vendakka is cut into slices and then fried or sauteed till it becomes crispy. This fried veggie is then mixed with yogurt and coconut sauce. Cut vendakka (ladies finger) into thin round slices. Grind grated coconut, green chilly and cumin into fine paste. Then add mustard seeds just crush them. In a bowl add curd, grinded paste and salt mix well and keep aside. Heat oil in pan add mustard seeds, curry leaves, red chilly and sliced lady’s finger fry them till brown and crisp, then mix this with beaten curd mix vendakka kichadi ready to serve.